Eric Reid is back in the NFL and played in his first game on Sunday after signing with the Carolina Panthers. Reid is a former teammate of Colin Kaepernick with the San Francisco 49ers and was the first player to join him in kneeling during the national anthem before games. The safety went unsigned as a free agent during the offseason and joined Kaepernick’s collusion case against the NFL. Reid will continue with the collusion case but had previously said he was unsure if he would still kneel during the anthem. 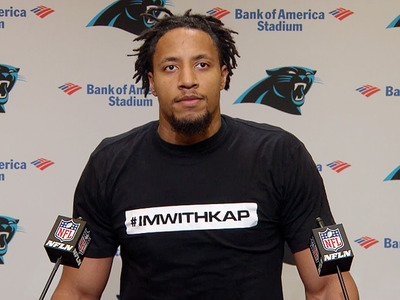 Former San Francisco 49ers safety Eric Reid is back in the NFL with the Carolina Panthers, and before his first game, he did kneel during the national anthem as part of his continued protest against social injustice. Reid had gone unsigned for six months as a free agent, which led to him joining Colin Kaepernick’s collusion case against the NFL. Reid is a former teammate of Kaepernick’s with the San Francisco 49ers and was the first player to join him in kneeling during anthems. 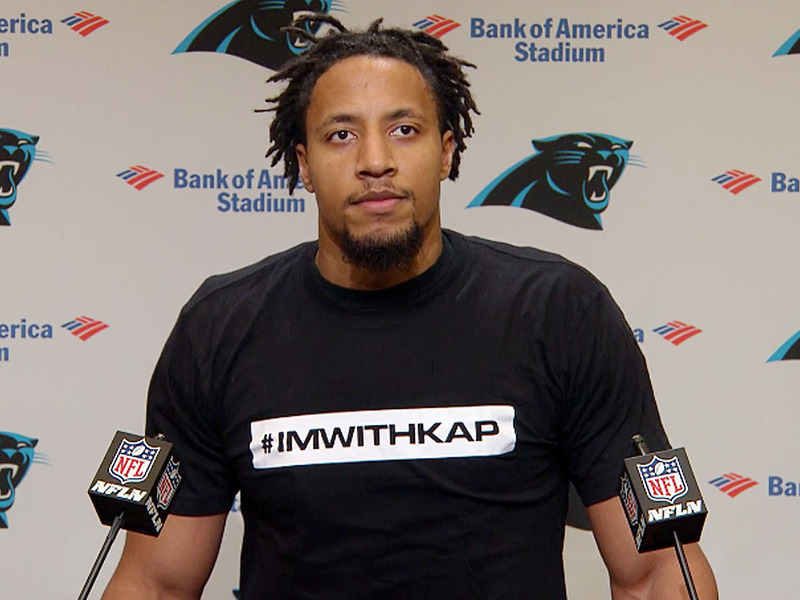 via Carolina Panthers/NFLEric Reid work a t-shirt supporting Colin Kaepernick during his first press conference with the Carolina Panthers. According to Ian Rapoport of the NFL Network, the Panthers did not ask Reid about his intentions to kneel or stand and made the signing based purely on football reasons.